After the War by Alice Adams is one of those rare books that defy the bad sequel status. Ms. Adams seamlessly returns to the town of Pinehill and its colorful residents, all the gossip and speculation clashing with reality, fantasies fueled by emotional inner dialog, secret affairs of which everyone is aware, conversations attributed to no one in particular such as one would overhear at social functions, and she serves it up deliciously as if the reader is a neighbor with privileged insight into everyone’s private and public lives. Ms. Adams addresses a new round of social and political issues through the different characters’ points of view, often having them use words deemed unacceptable in today’s society if not during the era in which the story takes place. By doing so, she challenges her readers to reflect upon private thoughts and experiences, examine one’s upbringing and prejudices, and form an opinion. As always, Ms. Adams’s prose is excellent, and she brilliantly breaks the rules of writing when she upsets the delicate balance of life in Pinehill with the unexpected death of a major character one third of the way into the story, draws the most peripheral of characters onto center stage, and begins or picks up storylines late in the novel only to conclude them with a satisfying ending. 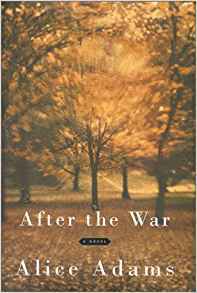 After the War is masterful storytelling from a gifted writer gone too soon. Another gorgeous review! Thank you Heather! I hope to see more soon. Hint. Hint. Thank you, Mark! I’m working on a few more good books, so I’ll have another review for you.